opportunities for watersports and fishing. a Private dock and boatlift for boating conveniences. NOTE: DEEP WATER in front of pier for those that have a boat. (3) Queen size bedrooms, (2)twin mattress sets for additional sleeping accomodations. 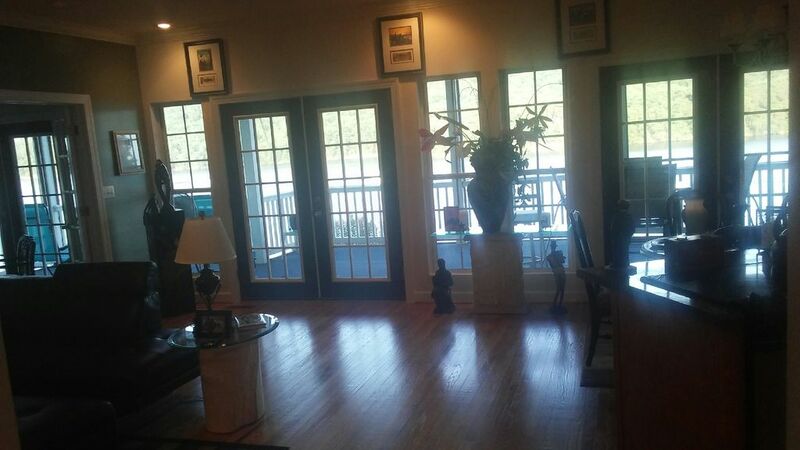 Large family and gameroom, private screened in outdoor room above the boat house for family gathering and dining. Pooltable & games, and barbeque grill for outdoor grilling. Beautiful. clean. restful. great views. great swimming and fishing! The property and location was everything the listing said it would be. The lake was beautiful and clean. Had a great time swimming, floating, fishing and relaxing! The house had everything we needed and more! My family and I spent a WONDERFUL WEEK ON BADIN LAKE AT SUNRISE RETREAT!!!!! The fishing was FANTASIC!!!!! !The location is absolutely beautiful and there were lots of people enjoying the lake for the holiday. The home is accommodating with immediate access to the lake. There were plenty of amenities which also allowed us to enjoy our stay. Great neighborhood with awesome neighbors. We can't wait until our next vacation. I was looking for a nice quiet retreat and this property fit the bill! The property was beautiful and well maintained,the fishing was great and the lake views are spectacular. Thank you for the rave review...we are pleased to know that you and your family enjoyed your stay here at Sunrise Retreat. We were looking for an adventurous spring break destination for my family and Badin Lake was the perfect solution! The accommodations were excellent with plenty of room to spread out especially needed with teenage boys. The lake was nice we enjoyed fishing, jet skiing and with the mountains close by hiking. I highly recommend this rental property and destination for your vacation needs. swimming, relaxing and hiking through the Uwharrie National Forest.